Strathcona is the neighborhood that makes up a portion of the infamous Down Town East Side or if you’re in Vancouver, the DTES. A part of the city known around the world for drugs and poverty. I walked around this neighborhood today and stayed around for a couple hours thinking about how it symbolized Vancouver as a whole and how the cars in the area reflect the changes. Vancouver is a tough place to live, perhaps one of the most expensive in North America. We pay the most for gas, some of the highest real estate costs, high taxes and high vehicle insurance costs. I know myself and the other Vancouver Oppo’s are always looking for a way out. There are 3 things in Vancouver that make headlines more than anything else: The fentanyl/heroin crisis, gentrification and Chinese investment. Strathcona is a neighborhood that brings all of those sharply into focus. 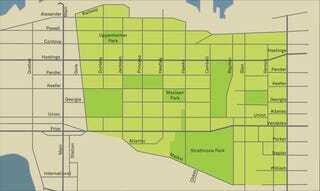 Strathcona is only 1.1 square miles in area with a median income $15,000CDN. However the property value is well north of $1M for your most basic run down home. The largest ethnic group in the area is Chinese (43%), there is a disproportionate amount of First Nations residents and the rest are mostly caucasian. Street signs, the school signage, the community centre are all bilingual Mandarin Chinese and English. The area represents the changing demographics across Vancouver, usually poorer working class families being unable to afford to live in areas that historically have been poorer while the property is either bought by foreign investors or torn down to make condos for well off white collar workers from the downtown core. The heritage homes that remain are usually divided into 3-4 smaller condos on the inside. The area also shows how Canada’s multiculturalism immigration policies are shaping the Country’s future. This brings many wonderful contributions to our society, but also leads to tensions and animosity by some in our population. The poverty and drug addiction in the neighborhood shows how much we as a country and a city are failing our most vulnerable members of society with over 300 dying over overdoses in Vancouver last year, most in the DTES. Then comes the cars, Downtown Vancouver is in general, anti car. Bikes and transit are the primary mode of transportation in the city. With the cost of living so high and the lack of land, it is tough to be a Jalop. Yet, on my walk, I still found some interesting cars.